Containing the Super Seven gem/element/flower essence combination and a blend of ancient essential oils that were used for annointing, this delicately fragranced aura spray supports your transformation journey. Working in the subtle energy fields around the body, this spray will complement the Super Seven essence program and can also be used as a stand alone spray to strengthen chakra alignment, open the nadi's, and fortify ability to 'keep on going'. No image can do this gem justice as it flashes with an internal fire as the light strikes it. Piercing, bold and inspirational, red zincite grounds your energy quickly into the earth star chakra. In these times of intense energetic inflluxes, this is a powerful assistant for anchoring in the higher energies. Red zincite stimulates the third eye and crown while holding you stable, and facilitates a strong and powerful creativity, giving you the energy to manifest creative impulses into reality. This elixir may be too intense for extended continual use, but balanced by dioptase on alternate days, will encourage integration of experiences and energy. A great elixir for the fiery summer months! A gentle, loving embrace from what is considered a true 'queen of jewels' and a master healer. Ruby, along with Sapphire and Diamond are considered among the most precious of gems and all have and bestow a profound inner strength. Ruby aligns the root chakra with the heart, brings cheerfulness and lifts mental burdens. It enhances intuition, is good for clearing physical infections, removes mental and ohysical obstacles and promotes tranquility. Ruby also enhances the qualities of all other gems and essences. This gem is perfect for holding the energy and connection to the Lion's Gate and carrying it forward into our lives. 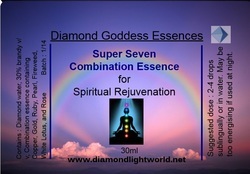 New Super Seven Combination Essence Program! Tired of struggling and processing? Then this special essence package is a gift that will uplift, regenerate, restore faith, joy, passion, purpose and take you beyond all the 'old' programs. Like the phoenix rising from the ashes, this is an essence program for transformational Spiritual and physical Rejuvenation. 7 x mp3's (one per week) for 7 weeks for a transformational healing experience. Special Bonus : The Diamond Light Grid Activation mp3 for added enhancement through aligning your Diamond Lightbody.